Although closed to traffic from Oxford Circus to Piccadilly Circus, it was still filled with cars – from the past, present and future – all taking part in the annual free-to-view Regent Street Motor Show, a Royal Automobile Club event. Alongside more than 100 veteran cars from the dawn of motoring were dozens of cars of tomorrow – low and zero emission battery-powered electric vehicles and hybrids. The veterans, all built before 1905, were taking part in their annual International Concours d’Elegance prior to setting off at dawn on Sunday morning for the trip from London to Brighton in the famous Veteran Car run. The overall winner was the sole surviving Krastin, one of just four cars believed to have been built by the innovative Latvian immigrant August Krastin in Cleveland, Ohio before fire destroyed his factory and the company was forced into bankruptcy. While the veterans turned the clock back as far as the late 19th century, another part of the show remembered 1976, the year when Britain’s James Hunt won the Formula 1 World Championship. Hunt’s McLaren’s M23 on display, with James’ son Freddie – who bears an uncanny resemblance to his father – on hand to pose for photographs and sign autographs. The McLaren was not the only F1 car on display, however, with a scarlet 1961 Ferrari Dino 246 F1 racer – the last front-engined car to win a Grand Prix – as the centre piece of a display promoting the Silverstone Classic, the world’s biggest classic motor racing event. And bringing the F1 story up to date was a modern-day Red Bull Racing car courtesy of Total and the popular Top Gear Experience which gave show-goers simulated rides in Lewis Hamilton’s F1 Mercedes. Motoring’s classic years were represented by displays from the Jaguar Drivers’ Club, including the XK140, E-type, XJ220 and current F-type, while fans of more obscure classics enjoyed a display of ultra-rare British-built Piper sports cars. Bringing the motoring story up to date were displays of modern cars and bikes from companies including Mini, Renault and Triumph, while The Mobility Roadshow was on hand to demonstrate how it can help disabled and older people with mobility needs. Go Ultra Low and Transport for London joined forces to offer drives in a wide range of contemporary battery-powered electric vehicles and plug-in petrol-electric hybrids from manufacturers including Renault, Audi, BMW, Kia, Mitsubishi, Nissan, Toyota and Volkswagen – with experts on hand to offer advice to anyone considering a zero or low emission car as their next purchase. Last year the Regent Street Motor Show drew a record 450,000 attendance and this year’s show appeared to be just as popular. 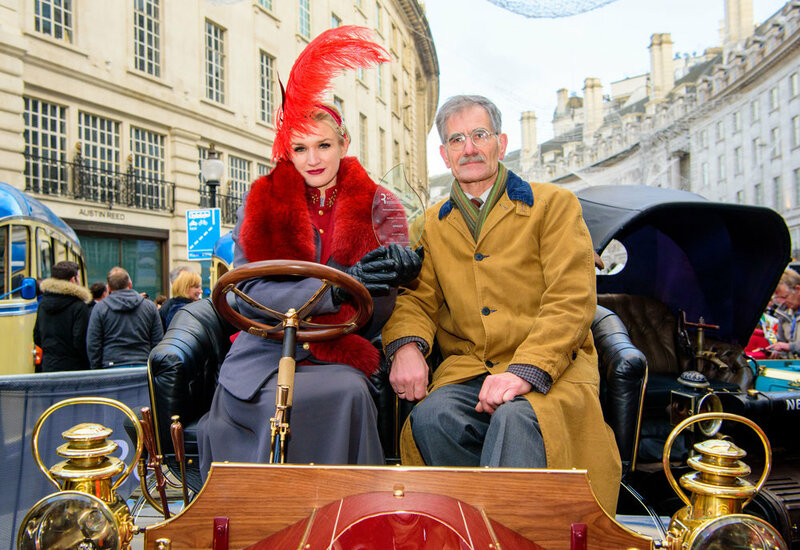 “The Regent Street Motor Show really does have something for everyone: the cars on display represent motoring history in its entirety, from the earliest days of the horseless carriage to the electric vehicles we will all be driving tomorrow,” said Peter Read, Chairman of the Royal Automobile Club’s Motoring Committee.